Breaking bread at the table has always meant more than caloric input for physical survival. While nourishment is important – and while, tragically, millions are still starving today – food has a way of communicating the noncommunicable. When no amount of words are sufficient to convey remorse and sorrow, food is the medium in which one heart is transplanted to another. Food’s role as communicator also transcends borders and race, and this truth was recently displayed on the shores of Jindo, where hundreds of distraught family members still await the return of their loved ones from the sunken Sewol ferry. Koreans and Turks affectionately refer to one another as “Brother Nations.” This bond was initially forged when a sleu of Turkish soldiers fought and died with other allies during the Korean War, and was readily apparent after the bronze medal football match between the two countries during the 2002 World Cup. 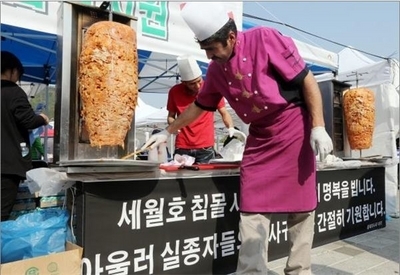 That is why Enes Kaya, Bal Zuma and their Turkish friends drove five hours from Seoul to Jindo on the wee morning hours of April 24 – with enough kebab for 2000 people. 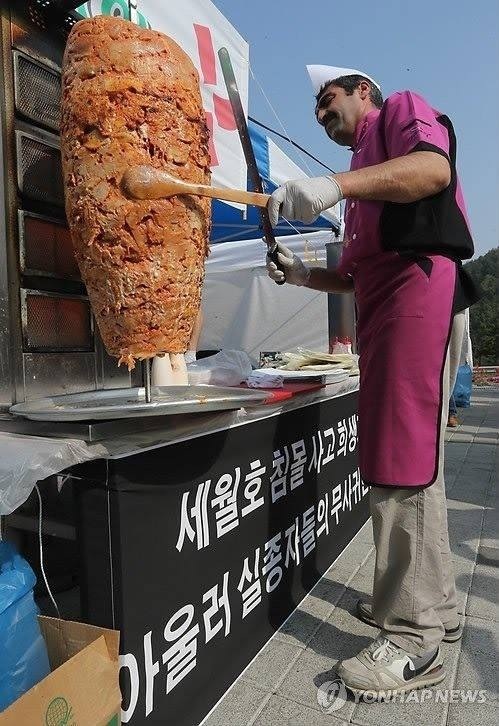 Upon arriving at Jindo at 7 a.m., the entourage checked in with authorities and set up their kebab truck near the community gymnasium, where most of the family members have been camping out for the past week. Heads started turning. First, the sight of foreigners in a sea of Koreans was not a common sight around the campground. Second, the smell of slow-roasting meat was also a novelty on those shores, particularly at that hour. Nevertheless, the entourage started serving free kebabs to anyone willing and able to eat breakfast. Turning heads lead to voiced complaints. Other volunteers from all over the country allegedly approached the entourage and the authorities and complained that the “smell” of kebab was “inappropriate” for such time of mourning. Many of the family members have not eaten for days, they said, and the smell of meat permeating the Jindo air was not appropriate for the occasion. Despite such dejection by some, the entourage carried on, serving fresh-made kebab to hundreds of volunteers and family members, and even hand-delivering the food to those unable to come to the truck. In tragic times like this, one is always careful about voicing one’s thoughts about anything. However, acts of kindness and compassion are always worth discussing. The “Kebab Volunteers” were not part of any large organization. They paid all of their expenses out of their own pockets, and drove five hours to a remote town, with the sole purpose of providing free food to devastated family members. This effort, however, was scolded by some because of alleged “cultural” differences, that the smell of roasting meat is inappropriate for times of sorrow. One cannot easily agree or disagree with such “cultural” notions. I am aware that, in the past, meat was reserved for festive occasions in Korea. However, this meat rarity was largely due to the country’s economic situation, where meat was expensive and one could only splurge on it when absolutely necessary, such as birthdays. In large part, that is not the case anymore. For the vast majority of the Korean population, meat in some form is consumed almost on a daily basis and is no longer reserved for festivities (although, admittedly, one still finds more quantities of meat during festivities). The same goes for the “smell” of roasting meat. One cannot help but imagine. If the Kebab Entourage was entirely composed of ethnic Koreans, and if they had served a different type of food, say sullungtang (ox bone soup with boiled beef) or bulgogi, would the people have reacted the same way? If, instead, Roy Choi of Kogi BBQ was there with one of his Kogi taco trucks, would they have reacted the same way? Sullungtang, bulgogi, Kogi tacos – all dishes would arguably perfume the area with the “smell” of meat. Was the scolding truly due to the smell of meat, or was it largely due to “unfamiliarity”? Unfamiliar people, unfamiliar food, unfamiliar smell. And what does this scolding say about Korean society as a whole? Maybe “meat during tragedy” is still inappropriate in Korean culture. Maybe the scolders were truly concerned for the well-being of the family members, that the smell of kebab would truly upset them. What the entourage did, however, resonates powerfully. Empathy transcends cultures. As with the entire Sewol situation, many questions remain. But one thing is certain. Food speaks, and these gents spoke loudly. Thank you. The images used in this post are owned by Newsis and Yonhap News. It’s a truly awful tragedy. I just blogged about this too, specifically on why I think that Western critics who try to link disasters like this to Korea’s Confucian culture are so often misguided. Please check it out at Sweet Pickles and Corn. Cheers!